Ramallah, December 31, 2018—The year 2018 was one of deep valleys and few peaks for Palestinian children. Within three days of of ringing in the new year, Israeli forces shot 16-year-old Palestinian Musab Tamimi in the neck during Ramallah-area clashes, killing him, in a violent start to the year. Israeli forces continued to kill Palestinian children at an average pace exceeding one child per week in 2018. At the bitter close of 52 weeks, 56 Palestinian children were dead due to Israeli forces’ actions. One child who reportedly carried out a fatal attack in a settlement was also killed by an Israeli settler. The two most recent child fatalities took place between December 20 and 21. Israeli forces shot and killed Mohammad Muin Khalil Jahjouh, 16, during “Great March of Return” protests near the perimeter fence east of Gaza City on December 21 around 4 pm. Mohammad sustained a gunshot wound to the neck and died shortly after in Shifa hospital, Gaza City. “I heard the scream of someone who was about five meters [16 feet] behind me. I turned my back to see what was happening, when I saw a 16-year-old boy lying on the ground with blood running from his neck to his chest,” a journalist who was photographing the protest told Defense for Children International – Palestine. The witness said that Mohammad was standing approximately 150 meters (492 feet) away from the perimeter fence, and some 80 meters (262 feet) away from a group of protestors who were throwing stones at Israeli soldiers stationed on the other side of the perimeter fence when he was shot. Around 9 p.m. on December 20, Israeli forces fired at a car traveling on a road near Beit El settlement, located near the Palestinian city of Ramallah in the central West Bank. A live bullet entered the car, striking Qassim Mohammed Ali al-Abbasi, 17, in the back and killing him, based on DCIP’s initial investigation. An eyewitness told DCIP that Qassim and some friends were travelling from his residence in the East Jerusalem neighborhood of Silwan to Nablus when their vehicle came under heavy shooting. When an Israeli military jeep pulled them over, the witness realized that Qassim was unconscious. Paramedics who arrived on the scene found no pulse and declared the child dead. Also among this year’s child fatalities was Gaza City resident Mohammad Naser Ziad al-Reefi, 13, who suffered a spinal cord injury from an Israeli drone-fired missile strike in 2014. The same strike also killed his twin brother and four other family members. Mohammad succumbed to his wounds November 3, in a central Gaza Strip hospital. Bringing the total number of Palestinian children killed by Israeli soldiers or settlers in 2018 up to 57 was 17-year-old Mohammad Tarek Ibrahim Dar Yousef. An Israeli settler killed Mohammad after the boy reportedly carried out a fatal stabbing attack in the illegal Israeli settlement of Geva Binyamin in the central West Bank on July 26, 2018. 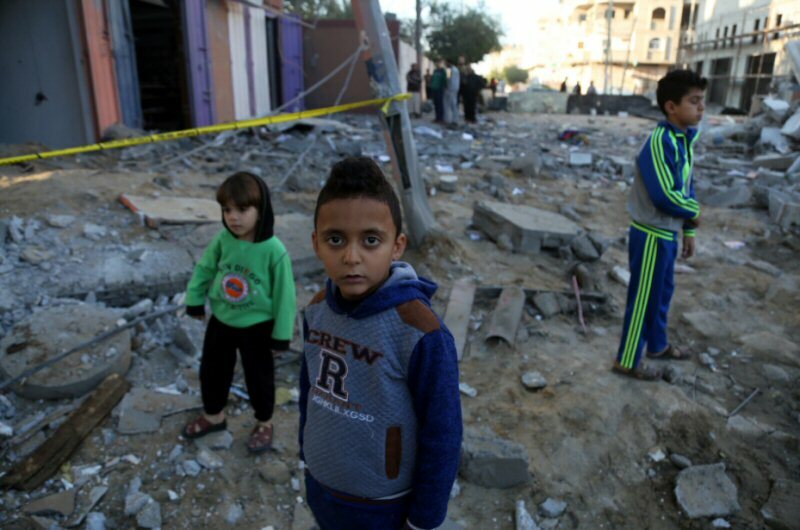 The vast majority of the fatalities, 86 percent, took place in the Gaza Strip. Of these, 46 children were killed by Israeli forces since March 30, often in the context of the “Great March of Return” protests and related activities. This number includes four-year-old Ahmad Yasser Sabri Abu Abed who was struck by bullet fragments on December 7 while in his father’s arms, dying four days later. Live ammunition accounted for 73 percent of the total child fatalities. In a number of cases, DCIP found no evidence that children presented a direct, mortal threat at the time that Israeli forces employed lethal force against them. In one such instance, on April 20, an Israeli sniper stationed on sand hill on other side of separation fence shot Mohammad Ibrahim Ayoub, 14, in the head while he was between 70-200 meters (230-656 feet) from the fence. A witness told DCIP that Mohammad was attempting to run away from tear gas at the time he was shot. Israeli forces shot 16-year-old Ahmad Misbah Abu Tyour in the foot on September 7 in Rafah and he succumbed to his wounds the following day. Video footage of the incident suggests he posed no threat when he was targeted with intentional lethal force. Under international law, lethal force may only be used as a last resort in circumstances where an individual poses an immediate threat to life or threat of serious injury. Despite this, accountability is extremely rare in cases where Israeli forces are accused of committing crimes against Palestinian children. Crowd control weapons proved lethal for four children who died after being struck by tear gas canisters or rubber-coated metal bullets. Crowd control weapons can carry deadly force when they strike children, particularly at close range or on the upper body. In addition to fatalities, DCIP documented a spike in the number of severe injuries to children across the Occupied Palestinian Territory (OPT). In 2018, DCIP documented at least 183 child injuries at the hands of Israeli forces, with 130 of these taking place in the Gaza Strip. Of critical concern are 19 children who suffered permanent disability as a result of injuries. The “Great March of Return” demonstrations began on March 30, 2018 in protest of Palestinian refugees’ inability to return to properties lost during events surrounding the establishment of the state of Israel in 1948. Approximately 70 percent of the Gaza Strip’s current 2 million residents are registered refugees of Palestine, according to UNRWA. In addition to the right of return, demonstrators are calling for an end to Israel’s air, land and sea blockade against the Gaza Strip, now in its 11th year. The blockade cuts the Gaza Strip off from the rest of the OPT and is one of the principal causes of the current dire humanitarian crisis. These mass protests, which have taken place weekly in the area along the Israeli-installed perimeter fence or near the Mediterranean shore, have drawn large and diverse crowds, including women, children, and elderly people. Protestors’ activities have involved erecting supporter tent encampments, peaceful gatherings or marches to the perimeter fence or shore, displaying signs and Palestinian flags, burning tires, efforts to pass through the perimeter fence on foot or the Israeli-enforced “no go zones” at sea on fishing boats, launching incendiary balloons across the perimeter fence, and throwing stones, molotov cocktails, firebombs or other objects toward the perimeter fence. Some civilians have developed other protest strategies such as the “night confusion unit” whose goal is to create distractions for Israeli forces late at night with loud sounds and fireworks. Another group has self-organized to construct large kites with flaming tales to be flown across the perimeter fence in order to start fires in Israeli agricultural fields and forests. Based on DCIP’s research and as confirmed by other human rights groups, the protests are organized independently by civilians, and not by directives of the Hamas-led government in the Gaza Strip. Protests continued after the opening of the U.S. Embassy to Jerusalem in May 2018, a move that was widely censured by global leaders. Each week, the protests have been met by a harsh Israeli response marked by an excessive use of force against unarmed civilians of all ages. In addition to tear gas and other crowd control weapons, Israeli forces stationed in armored vehicles on the Israeli side of the perimeter fence have frequently employing live ammunition against protestors. “The large number of casualties among unarmed Palestinian demonstrators, including a high percentage of demonstrators hit by live ammunition, has raised concerns about excessive use of force by Israeli troops,” the UN Office for the Coordination of Humanitarian Affairs (OCHA) stated. Two children died between April and July during explosions related to activities of Palestinian armed groups in the Gaza Strip. Odai Ahmad Mansour Abu Hassan, 11, died when an improvised device exploded on his roof in Gaza City on July 15. The child’s father was a field commander in the Nabil Massoud Brigades of Al-Aqsa Martyrs Brigades, a military wing of the Fatah movement, in charge of a rocket unit in the Gaza Strip, the family told DCIP. Evidence collected by DCIP suggested the explosion was accidental. Hashem Abdulfattah Othman Kallab, 17, was traveling in a rickshaw in the southern Gaza Strip on April 11 with three others when an accidental explosion ignited, killing them all. Al-Quds Brigades, the armed wing of Islamic Jihad, identified Hashem among a group of members killed. Amid heightened allegations of child recruitment in the Gaza Strip, DCIP investigated five additional instances of potential child recruitment among children killed by Israeli forces in the context of ‘March of Return’ protests. For each of these five cases, DCIP concluded that the children were protesting as civilians at the time they were killed. Between January and November of this year, DCIP documented 140 cases of Palestinian children who were detained by Palestinian forces. A high number of the arrests DCIP documented, 31, were detained using improper procedures and by bodies not authorized to carry out arrests. Of these, 18 were carried out by the Criminal Investigation police. Under the 2016 Palestinian juvenile protection law, the juvenile prosecutor is the only party authorized to order a child’s detention, per Article 20. Once an arrest is so ordered, the Palestinian juvenile police force is the singular body legally sanctioned to carry out the arrest. Based on Article 18 of the juvenile protection law, if a child is arrested by any party other than the Palestinian juvenile police while actively committing a crime, the child must immediately be turned over to the juvenile police and brought before the juvenile prosecutor within 24 hours. Arrests carried out by other bodies in the absence of an active crime — or cases where the child is arrested by other bodies while in the process of committing an offense and the child is not quickly handed over to the juvenile police — deny children access to due process and other safeguards afforded to them by the new law. Gravely, 35 children reported physical abuse during the course of their detention. In 31 cases, children said they were detained or transferred with adults. In 2018, DCIP documented 120 Palestinian child detention cases from the West Bank. More than half of the children arrested by Israeli forces whose cases DCIP documented reported experiencing verbal abuse, threats, humiliation or intimidation. The vast majority, over 75 percent, said they were physically abused during the course of their detention. While under pre-trial detention, Israeli forces placed 22 children in isolation for a period of 48 hours or more. The longest period of isolation that DCIP documented in 2018 was 30 days. Israel has the dubious distinction of being the only country in the world that systematically prosecutes an approximately 700 children each year in military courts lacking fundamental fair trial rights. Children within the Israeli military system commonly report physical and verbal abuse from the moment of their arrest, and coercion and threats during interrogations. Visit Defense for Children International – Palestine (DCIP).